There’s an Internet controversy going on between Dale Dougherty, the CEO of Maker Media and Naomi Wu (@realsexycyborg), a Chinese Maker and Internet personality. Briefly, Dale Doughtery tweeted a single line questioning Naomi Wu’s authenticity, which is destroying Naomi’s reputation and livelihood in China. In short, I am in support of Naomi Wu. Rather than let the Internet speculate on why, I am sharing my perspectives on the situation preemptively. As with most Internet controversies, it’s messy and emotional. I will try my best to outline the biases and issues I have observed. Of course, everyone has their perspective; you don’t have to agree with mine. And I suspect many of my core audience will dislike and disagree with this post. However, the beginning of healing starts with sharing and listening. I will share, and I respectfully request that readers read the entire content of this post before attacking any individual point out of context. All these forces came together in a perfect storm this past week. If someone asked you to draw a picture of an engineer, who would you draw? As you draw the figure, the gender assigned is a reflection of your mental prototype of an engineer – your own prototype bias. Most will draw a male figure. Society is biased to assign high-level intellectual ability to males, and this bias starts at a young age. Situations that don’t fit into your prototypes can feel threatening; studies have shown that men defend their standing by undermining the success of women in STEM initiatives. The bias is real and pervasive. For example, my co-founder in Chibitronics, Jie Qi, is female. The company is founded on technology that is a direct result of her MIT Media Lab PhD dissertation. She is the inventor of paper electronics. I am a supporting actor in her show. Despite laying this fact out repeatedly, she still receives comments and innuendo implying that I am the inventor or more influential than I really am in the development process. Any engineer who observes a bias in a system and chooses not to pro-actively correct for it is either a bad engineer or they stand to benefit from the bias. So much of engineering is about compensating, trimming, and equalizing imperfections out of real systems: wrap a feedback loop around it, and force the error function to zero. So when Jie and I stand on stage together, prototype bias causes people to assume I’m the one who invented the technology. Given that I’m aware of the bias, does it make sense to give us equal time on the stage? No – that would be like knowing there is uneven loss in a channel and then being surprised when certain frequency bands are suppressed by the time it hits the receivers. So, I make a conscious and deliberate effort to showcase her contributions and to ensure her voice is the first and last voice you hear. Naomi Wu (pictured below) likely challenges your prototypical ideal of an engineer. I imagine many people feel a cognitive dissonance juxtaposing the label “engineer” or “Maker” with her appearance. The strength of that dissonant feeling is proportional to the amount of prototype bias you have. I’ve been fortunate to experience breaking my own prototypical notions that associate certain dress norms with intelligence. I’m a regular at Burning Man, and my theme camp is dominated by scientists and engineers. I’ve discussed injection molding with men in pink tutus and learned about plasmonics from half-naked women. It’s not a big leap for me to accept Naomi as a Maker. I’m glad she’s challenging these biases. I do my best engineering when sitting half-naked at my desk. I find shirts and pants to be uncomfortable. I don’t have the strength to challenge these social norms, and secretly, I’m glad someone is. Unfortunately, prototype bias is only the first challenge confronted in this situation. The Idol Effect is the tendency to assign exaggerated capabilities to public figures and celebrities. The adage “never meet your childhood hero” is a corollary of the Idol Effect – people have inflated expectations about what celebrities can do, so it’s often disappointing when you find out they are humans just like us. One result of the Idol Effect is that people feel justified taking pot shots at public figures for their shortcomings. For example, I have had the great privilege of working with Edward Snowden. One of my favorite things about working with him is that he is humble and quick to correct misconceptions about his personal abilities. Because of his self-awareness of his limitations, it’s easier for me to trust his assertions, and he’s also a fast learner because he’s not afraid to ask questions. Notably, he’s never claimed to be a genius, so I’m always taken aback when intelligent people pull me aside and whisper in my ear, “You know, I hear Ed’s a n00b. He’s just using you.” Somehow, because of Ed’s worldwide level of fame that’s strongly associated with security technology, people assume he should be a genius level crypto-hacker and are quick to point out that he’s not. Really? Ed is risking his life because he believes in something. I admire his dedication to the cause, and I enjoy working with him because he’s got good ideas, a good heart, and he’s fun to be with. Because I also have a public profile, the Idol Effect impacts me too. I’m bad at math, can’t tie knots, a mediocre programmer…the list goes on. If there’s firmware in a product I’ve touched, it’s likely to have been written by Sean ‘xobs’ Cross, not me. If there’s analytics or informatics involved, it’s likely my partner wrote the analysis scripts. She also edits all my blog posts (including this one) and has helped me craft my most viral tweets – because she’s a genius at informatics, she can run analyses on how to target key words and pick times of day to get maximum impact. The fact that I have a team of people helping me polish my work makes me look better than I really am, and people tend to assign capabilities to me that I don’t really have. Does this mean I am a front, fraud or a persona? I imagine Naomi is a victim of Idol Effect too. Similar to Snowden, one of the reasons I’ve enjoyed interacting with Naomi is that she’s been quick to correct misconceptions about her abilities, she’s not afraid to ask for help, and she’s a quick learner. Though many may disapprove of her rhetoric on Twitter, please keep in mind English is her second language — her sole cultural context in which she learned English was via the Internet by reading social media and chat rooms. Based on the rumors I’ve read, it seems fans and observers have inflated expectations for her abilities, and because of uncorrected prototype bias, she faces extra scrutiny to prove her abilities. Somehow the fact that she almost cuts her finger using a scraper to remove a 3D print is “evidence” that she’s not a Maker. If that’s true, I’m not a Maker either. I always have trouble releasing 3D prints from print stages. They’ve routinely popped off and flown across the room, and I’ve almost cut my fingers plenty of times with the scraper. But I still keep on trying and learning – that’s the point. And then there’s the suggestion that because a man holds the camera, he’s feeding her lines. When a man harnesses the efforts of a team, they call him a CEO and give him a bonus. But when a woman harnesses the efforts of a team, she gets accused of being a persona and a front. This is uncorrected Prototype Bias meeting unrealistic expectations due to the Idol Effect. Power is not distributed evenly in the world. That’s a fact of life. Not acknowledging the role power plays leads to systemic abuse, like those documented in the Caldbeck or Weinstein scandals. Editors and journalists – those with direct control over what gets circulated in the media – have a lot of power. Their thoughts and opinions can reach and influence a massive population very quickly. Rumors are just rumors until media outlets breathe life into them, at which point they become an incurable cancer on someone’s career. Editors and journalists must be mindful of the power they wield and held accountable for when it is mis-used. As CEO of Maker Media and head of an influential media outlet, especially among the DIY community, Dale Dougherty wields substantial power. So a tweet promulgating the idea that Naomi might be a persona or a fake does not land lightly. In the post-truth era, it’s especially incumbent upon traditional media to double-check rumors before citing them in any context. Yet Dale decided to take an anonymous poster’s opinion over mine (despite a long working relationship with Make), and a few days later on November 5th he tweeted a link to the post suggesting Naomi could be a fake or a fraud, despite having evidence of the contrary. So now Naomi, already facing prototype bias and idol-effect expectations, gets a big media personality with substantial power propagating rumors that she is a fake and a fraud. But wait, it gets worse because Naomi is in China! In China, guanxi (关系) is everything. Public reputation is extremely hard to build, and quick to lose. Faking and cloning is a real problem, but it’s important to not lose sight of the fact that there are good, hard-working people in China as well. So how do the Chinese locals figure out who to trust? Guanxi is a major mechanism used inside China to sort the good from the bad – it’s a social network of credible people vouching for each other. For better or for worse, the Chinese feel that Western faces and brands are more credible. The endorsement of a famous Western brand carries a lot of weight; for example Leonardo DiCaprio is the brand ambassador for BYD (a large Chinese car maker). 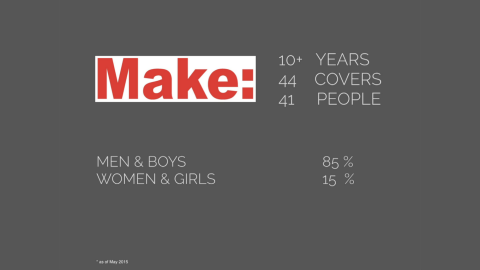 Maker Media has a massive reputation in China. From glitzy Maker Faires to the Communist party’s endorsement of Maker-ed and Maker spaces as a national objective, an association or the lack thereof with Maker Media can make or break a reputation. This is no exception for Naomi. Her uniqueness as a Maker combined with her talent at marketing has enabled her to do product reviews and endorsements as source of income. However, for several years she’s been excluded from the Shenzhen Maker Faire lineup, even in events that she should have been a shoo-in for her: wearables, Maker fashion shows, 3D printing. Despite this lack of endorsement, she’s built her own social media follower base both inside and outside of China, and built a brand around herself. Unfortunately, when the CEO of Maker Media, a white male leader of an established American brand, suggested Naomi was a potential fake, the Internet inside China exploded on her. Sponsors cancelled engagements with her. Followers turned into trolls. She can’t be seen publicly with men (because others will say the males are the real Maker, see “prototype bias”), and as a result faces a greater threat of physical violence. A single innuendo, amplified by Power Asymmetry and Guanxi Bias, on top of Idol Effect meshed against Prototype Bias, has destroyed everything a Maker has worked so hard to build over the past few years. If someone spread lies about you and destroyed your livelihood – what would you do? Everyone would react a little differently, but make no mistake: at this point she’s got nothing left to lose, and she’s very angry. 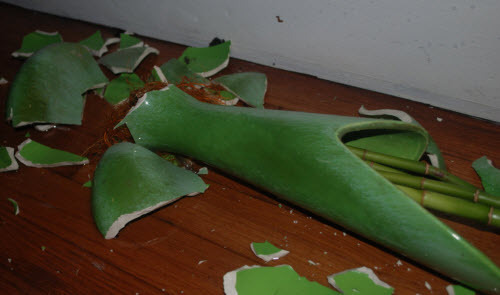 Although Dale had issued a public apology about the rumors, the apology fixes her reputation as much as saying “sorry” repairs a vase smashed on the floor. At this point you might ask — why would Dale want to slander Naomi? Dale could have recognized and addressed this core issue of a lack of diversity. Instead, Dale elected to endorse unsubstantiated claims and destroy a young female Maker’s reputation and career. Naomi has a long, uphill road ahead of her. On the other hand, I’m sure Dale will do fine – he’s charismatic, affable, and powerful. When I sit and think, how would I feel if this happened to the women closest to me? I get goosebumps – the effect would be chilling; the combination of pervasive social biases would overwhelm logic and fact. So even though I may not agree with everything Naomi says or does, I have decided that in the bigger picture, hiding in complicit silence on the sidelines is not acceptable. We need to acknowledge that prototype bias is real; if equality is the goal, we need to be proactive in correcting it. Just because someone is famous doesn’t mean they are perfect. People with power need to be held accountable in how they wield it. And finally, cross-cultural issues are complicated and delicate. All sides need to open their eyes, ears, and hearts and realize we’re all human. Tweets may seem like harmless pricks to the skin, but we all bleed when pricked. For humanity to survive, we need to stop pricking each other lest we all bleed to death. Make has issued an apology, and Naomi has accepted the apology. My sincere thanks to the effort and dedication of everyone who helped make this right. I recently did an interview for CSDN.net, which stands for “China Software Developer Network”, or more colloquially, “Programmer Magazine”, about open source hardware, and what it means to be a hacker. The interview itself is in Chinese (print version), but I thought I’d post the English translation here for non-Chinese readers. CSDN: The Maker and Open hardware movements attract a lot of attention recent years, Chris Anderson wrote a book Makers, Paul Graham called it The Hardware Renaissance. From your perspective and observation, how do you think about this movement will affect ordinary people, developers and our IT industry? bunnie: This movement, as it may be, is more of a symptom than a cause, in my opinion. Let’s review how we got here today. In 1960, for all practical purposes there was only hardware, and it was all open. When you bought a transistor radio, it had its schematic printed in the back. If it broke, you had to fix it yourself. It was popular to buy kits to make your own radios. Around 1980-1990, the personal computer revolution began. Computers started to become powerful enough to run software that was interesting and enabling. From 1990-2005, Moore’s Law drove computers to be twice as fast, and have twice as much memory every 1.5-2 years. All that mattered in this regime is the software; unless you could afford to fab a chip in the latest technology, it wasn’t worth it to make hardware, because by the time you got the components together a new chip was out that made your design look slow. It also wasn’t worth it to optimize software. By the time you made your software optimized, you could have bought a faster computer and run the old software even faster. What mattered was features, convenience, creativity. “Making” fell out of fashion: you had to ship code or die, there was no time to make. From 2005-2010, computers didn’t get much faster in terms of MHz, but they got smaller. Smartphones were born. Everything became an app, and everything is becoming connected. From about 2010-now, we find that Moore’s Law is slowing down. This slowdown is rippling through the innovation chain. PCs are not getting faster, better, or cheaper in a meaningful way; basically we buy a PC just to replace a broken one, not because it’s so much better. It’s a little bit too early to tell, but smartphones may also be solidifying as a platform: the iPhone5 is quite similar to the iPhone4; the Samsung phones are also looking pretty similar across revisions. How to innovate? how to create market differentiation? With Moore’s Law slowing down, it’s now possible to innovate in hardware and not have your innovation look slow because a new chip came out. You have steady platforms (PCs, smartphones, tablets) which you can target your hardware ideas toward. You don’t have to necessarily be fabbing chips just to have an advantage. We are now sifting through our past, looking for niches that were overlooked during the initial fast-paced growth of technology. Even an outdated smartphone motherboard can look amazing when you put it in quadcopters, satellites, HVAC systems, automobiles, energy monitoring systems, health monitoring systems, etc. Furthermore, as humans we fundamentally feel differently toward “real” things as opposed to “virtual” things. As wonderful as apps are, a human home consists of more than a smartphone, a food tray, a bed and a toilet. We still surround ourselves with knick-knacks, photos of friends, physical gifts we give each other on special occasions. I don’t think we will ever get to the point where getting a “virtual” teddy bear app will be as valued as getting a “real” teddy bear. As a result, there will always be a place for people to make hardware that fills this need for tangible goods. This hardware will merge more technology and run more software, but in the end, there is a space for Makers and hardware startups, and that space is just getting bigger now that hardware technology is stabilizing. CSDN: Compared with the past, Arduino and Raspberry Pi’s appearance seems to reduce the threshold of doing hardware design, what do you think this will effect hardware product industry? Do you think these platforms will bring real leaps and bounds in the industry? Or to make really innovative hardware product, what do we need? bunnie: Arduino and RPi serve specific market niches. Arduino’s key contribution is the reduction of computation to a easy-to-use physical form. It was made first and foremost by designers and artists, and less so by technologists. This unique perspective on technology turned out to be very powerful: it turns out people who aren’t programmers or hardware designers also want to access hardware technology. Some very moving and deep interactive art pieces have been made using the Arduino, allowing hardware to transcend menial control applications into something that changes your mood or makes you think about life differently. I think Arduino is just the first step toward taking the “tech” out of technology and letting every day people not just use technology, but create with it. There will be other platforms, for sure. Raspberry Pi is a very inexpensive embedded hardware reference module; it is cheap enough that for many applications, it’s just fine to buy the RPi as-is and you don’t have to design your own hardware. I think there will also be other followers in their footsteps. The nice thing about RPi for hardware professionals is that instead of buying a reference design and then having to spin your own board, you can just buy the RPi and ship it in the product. For people who have relatively low-volume products, this makes sense. CSDN: When new concept or technologies first appear, they always cause a lot of optimism discussion, but most of them, only take a long time development, will really affect our lives. When we are talking about Marker or Open hardware movement, are we too optimistic? For the average person, if there are common misunderstandings about this field? bunnie: Yes, it does take a long time for technology to really change our lives. The Maker movement, I think, is less about developing products, and more about developing people. It’s about helping people realize that technology is something man-made, and because of this, every person has the power to control it: it just takes some knowledge. There is no magic in technology. Another way to look at it is, we can all be magicians with a little training. Open Hardware is more of a philosophy. The success or failure of a product is largely disconnected with whether the hardware is open or closed. Closing hardware doesn’t stop people from cloning or copying, and opening hardware doesn’t mean that bad ideas will be copied simply because they are open. Unlike software, hardware requires a supply chain, distribution, and a network of relationships to build it at a low cost. Because of this, hardware being open or closed is only a small part of the equation for hardware, and mostly it’s a question of how much you want to involve end users or third parties to modify or interoperate with your product. CSDN: When we look at the future of open source hardware, could we analogy it with the open source software industry that we have already seen (many commercial companies also support open source software, many software companies to provide support for the open source software for living)? What are the difference between them? bunnie: I don’t think the analogy is quite the same. In software, the cost to copy, modify, and distribute is basically zero. I can download a copy of linux, and run “make” and have the same high-quality kernel running on my desktop as runs on top-end servers and supercomputers. In hardware, there is a real cost to copy hardware. And the cost of the parts, the factories and skilled workers used to build them, the quality control procedures, and the process to build are all important factors in how the final hardware cost, looks, feels, and performs. Simply giving someone a copy of my schematics and drawings doesn’t mean they can make exactly my product. Even injection molding has art to it: if I give the same CAD drawing to two tooling makers, the outcome can be very different depending on where the mold maker decides to place the gates, the ejector pins, the cooling for the mold, the mold cycle time, temperature, etc. And then there is the distribution channel, reverse logistics, financing, etc. ; even as the world becomes more efficient at logistics, you will never be able to buy a TV as easily as you can download the movies that you watch on the same TV. CSDN: What kind of business model do you think is ideal for open source hardware company? Could you give an example? bunnie: One of my key theories behind open source hardware is that hardware, at least at the level of schematics and PCB layout, is “essentially open”. This is because for a relatively small amount of money you can pay services to extract the detail required to copy a PCB design. Therefore an asymptotic assumption is that once you have shipped hardware, it can be copied. If you can accept this assumption, then not releasing schematics and PCB layouts will not stop people from copying your goods. It will be copied if someone wants to copy it. So it makes no difference to copying whether or not you have shared your design files. However, if you do share your design files, it does make a difference to a different and important group of people. There are other businesses and individual innovators who could use your design files to design accessories, upgrades, or third party enhancements that rely upon your product. Thus, in a “limiting case”, sharing your design files doesn’t change the situation on copying, but does improve your opportunity for new business relationships. Therefore, the practical suggestion is to just share the design files, using the guidelines of the open source hardware licenses to help reserve a few basic rights and protections. Clearly, there are some hardware strategies that are not compatible with the idea of open hardware. If your sole value to the consumer is your ability to make stand-alone hardware, and you have no strategic advantage in terms of cost, then you would like to keep your plans secret to try to delay the low-cost copiers for as long as you can. However, we are finding today that the most innovative products are not just a piece of hardware, but they also involve software and services. Open hardware business models work better when they are in such hybrid products. In many cases, consumers are willing to pay annuity revenue in some form (e.g. subscriptions, advertising, upsells, accessories, royalties and upgrades) for many types of products. In fact, it is most profitable to just collect these fees and not involve yourself in the hardware manufacturing portion; and it is much easier to control access to an ongoing service than it is to the plans of a piece of hardware. Thus, if you are running an on-line service that is coupled to your hardware, open hardware makes a lot of sense: if your on-line service is profitable, letting other people copy the hardware, sell it, and then add more users to your on-line service simply means you get more revenue without more risk in the production of hardware. CSDN: We know you often come to China and know a lot about this country. China’s software technology is not advanced, do you think its current position — the world factory center will help it improve its overall level of technology? How can this country change to a design, research and development focus place but not just a manufacturing center? What is China missing? bunnie: I wouldn’t say I know much about China. I know a little bit about one small corner of China in one specific area — hardware manufacturing. If there is one thing I do know about China, it’s that it is a very big country, with many different kind of people, and a long history that I am only beginning to understand. However, the history of high technology is almost entirely contained within my life span, so I can comment on the relationship between high technology and people, from which we can derive some perspective about China. The first observation is that every technology power-house today started with manufacturing. The US started as simple colonies of Britain, mining ores, trapping furs and farming cotton and tobacco. Over time, the US had steel mills and linen production. It wasn’t until the early 1900’s before the US really started to rise in developing original technology, and not until the mid 1900’s before things really took off. The same goes for Japan. They started in manufacturing, copying many of the US made goods. In fact the first cars and radios they made were, if you believe the historical accounts, not so good. It took the US and Japan decades to go from a manufacturing-based economy to a service-based economy. If you compare that to China, the electronics manufacturing industry started there maybe only 20 years ago, at most, and China is just turning the corner from being a manufacturing-oriented economy to one that can do more design and software technology. I believe this is a natural series of events: some portion of entry-level workers will eventually become technicians, then some technicians become designers, then some designers become successful entrepreneurs. In terms of concrete numbers, if you have 10 million factories workers, maybe 1% of them will learn enough from their job such that after a few years they can become technicians. This gives you 100,000 technicians. After a few years of technician work, maybe 1% will gain enough skill to become original designers. This gives you 1,000 designers. These experienced, grass-roots designers become the core of your entrepreneurial economy, and from there the economy begins to transform. From a thousand companies, you will eventually winnow down to just a handful of global brand companies. This whole process takes a decade or two, and I believe we are currently witnessing China going through the final phase of the transformation, where we now have a lot of people in Shenzhen who have the experience of manufacturing, the wisdom to do design, and now are just starting to apply their talent to innovation and original product design. The next decade will be an exciting one for China’s technology industry, if the current policies on economic and intellectual development stay roughly on course. This pattern applies primarily to hardware or hardware-dominated products. Software products have a similar pattern, but I believe there are unique cultural aspects that can give the West an advantage in software design. In hardware, if a process is not efficient or producing low yield, one can easily identify the root cause and produce direct physical evidence of the problem. Hardware problems, in essence, are indisputable. In software, if code is not efficient or poorly written, it’s very hard to identify the exact problem that causes it. One can see the evidence of programs crashing or running slowly, but there is no broken wire or missing screw you can simply hold up and show everyone to show why the software is broken. Instead, you need to sit down with your collaborators and review a complex design, consider many opinions, and ultimately you need to identify a problem which is ultimately due to a bad decision made by an individual, and nothing more than that. All software APIs are simply constructs of human opinions: nothing more. Asian cultures have a strong focus on guanxi, reputation, and respect for the elders. The West tends to be more rebellious and willing to accept outsiders as champions, and they have less respect for the advice of elders. As a result, I think it’s very culturally difficult in an Asian context to discuss code quality and architectural decisions. The field of software itself is only 30 years old, and older, more experienced engineers are also the most out of date in terms of methodology and knowledge. In fact, the young engineers often have the best ideas. However, if it’s culturally difficult for the young engineers to challenge the decisions of the elder engineers, you end up with poorly architected code, and you have no hope to be competitive. It’s not hopeless to overcome these obstacles, but it requires a very strong management philosophy to enforce the correct incentives and culture. The workers should be rewarded fairly for making correct decisions, and there can be no favorites based upon friendship, relationship, or seniority. Senior engineers and managers must see a real financial reward for accepting their mistakes, instead of saving face by forcing junior engineers to code patches around their bad high level decisions. Usually, this alignment is achieved in US contexts by sharing equity in a company among the engineers, so that the big payout only comes if the company as a whole survives, regardless of the ego of the individual. CSDN: What do you think the role (or relationship) of individual maker and commercial company in the future? And as individual maker may not only compete with commercial companies, but also will compete with other makers in the future, what are the factors critical to the success of a product? bunnie: As a general trend, MOQs are reducing and innovation is getting closer to the edge. So I think commercial companies will see more competition from Makers, especially as the logistics industry transforms itself into a API that can plug directly into websites. At the end of the day, the most critical factors to success will still be how much value the consumer will perceive from the product. A part of this is related to superior features and good product quality, but also an important part of this is in the presentation to the consumer and how clearly the benefits are explained. As a result, it’s important to make sure the product is visually appealing, easy to use, and to create marketing material that clearly explains the benefit of the product to the customer. This is often a challenge for individual makers, because their talent is normally in the making of the product’s technical value, but less so on the marketing and sales value. Makers who can master both will have an edge over makers who focus specifically on offering just a technical value. CSDN: You have participated in the development process of many products, what is your personal goal? In this long period, what is the greatest pleasure? bunnie: I would like to make people happy by building things that improve their life in some way. The greatest pleasure is to see someone enjoying something you have made because you have improved their life in some small way. Sometimes your product is solving a big problem for them. Other times it is more whimsical and happiness comes from fun or beauty. But either way, you are helping another person. That is what is important to me. One thing I have learned in the past few years is that money beyond a certain level doesn’t make me any happier. This makes me difficult to work with, because it’s hard for people to just hire my service by offering me a lot of money. Instead, they need to convince me that the activity will somehow also make people happy. Another important goal for me is to just understand how the world works. I have a natural curiosity and I want to learn and understand all kinds of things. The universe has a lot of patterns to it, and sometimes you will find seemingly unrelated pieces fitting together just like magic. Discovering these links and seeing the world fit together like a big jigsaw puzzle is very profound and satisfying. CSDN: Which project you focus on recently? Why you choose them? bunnie: I haven’t really been focused, actually. Recently, I have intentionally been *not* focused. If you focus on one idea for too long, many good innovative ideas just pass you by. One of the hardest parts of being an entrepreneur or innovator is to have the patience to review many ideas, know when to say no to bad ideas, and then cultivate a few good ideas at the same time, and to accept many changes to your concept along the way. This process can take months, if not years. I have a project to build my own laptop, but it’s not meant to be a business. It’s a subject meant to encourage personal growth, to challenge my abilities and learn things that I don’t know about the entire computer design process. I have a project to reverse engineer the firmware in SD cards. It’s also not a business, it’s meant to satisfy my curiosity. I have a project to learn how companies in Shenzhen build such amazing phones for such a low price. If I can learn some of their techniques, then hopefully I can apply this knowledge to create new and compelling products that make people happy. I have a project to build flexible circuit stickers. It will hopefully help introduce more people into using technology in their everyday life. It will also challenge my understanding of manufacturing processes, as I must develop a few new processes that don’t exist today to make the stickers robust and inexpensive enough for every day use. I have a project to help advise new entrepreneurs and innovators, and help get them started on their adventures. I may not have the best ideas, or all the talent needed to make a business, but if I can help teach others to fly, then maybe that can make up for my inability to find success in business. So, I have many projects, and no focus. Maybe someday I will find one to focus on — sometimes it is also important to focus — but as of today, I haven’t found what I’m looking for. CSDN: Failure tends to give people more experience, could you talk about the not-so-successful projects you have participated, or if you’ve ever seen other failed projects that inspired you. bunnie: My life is a story of failures. The only thing I have done repeatedly and reliably is fail. However, I have two rules when handling failure: (1) don’t give up and (2) don’t make the same mistake twice. If you follow these rules, eventually, you will find a success after many failures. Actually, I have an interview that focuses on one of my recent failures. You can read it here. CSDN: Your book Hacking the Xbox has been published ten years, for people who want to learn reverse engineering, or want to become a hardware hacker today, whether these experiences and skills has still apply? bunnie: I’d like to think that the core principles covered in the book are still relevant today. The Xbox is simply an example of how to do things, but the approach described in the book and the techniques are applicable to a broad range of problems. For the Chinese audience, I have found the mobile phone repair manuals to be quite interesting to read. I have bought a couple of them, and even though I can’t read Chinese well, I still find them pretty interesting. Sometimes their descriptions on the theory of electronics are not completely accurate, but practically speaking they are good enough, and it’s a quick way to get started while learning immediately useful skills in repairing phones. There’s also a Chinese magazine, 无线电, which I have found to be quite good. If you get started building the projects in there, I think you will learn very quickly. CSDN: For users, the new Xbox One has more stringent restrictions, what do you think about this? Do you have interesting to explore this black box and upgrade your book? bunnie: I haven’t done much work on video game consoles in a while — there is a whole new generation of console hackers who are excited to explore them, and I’m happy for that. As for the Xbox One security, I’m sure it is one of the most secure systems built. They did a very good job on the Xbox360, and I know some of the Xbox One security team members and they have a very solid understanding of the principles needed to build secure hardware. It should be very hard to crack. That being said, I’m glad I have no desire to buy or use one. I think it would become very frustrated with their use policies and restrictions very quickly. CSDN: There are a lot of controversy about if electronic devices should have a lock to prevent user rooting, what do you think about this? Whether there is a contradiction between ensure the safety of user and make user get complete control of their device? bunnie: I believe users should “own” their hardware, and “owning” means having the right to modify, change, etc. including root access rights. If the company has a concern about users being unsafe, then it’s easy enough to include an “opt-out” where users can simply select an electronic waiver form, and give up their support and warranty right to gain access to their own machine. Most people who care to root their machine are already smarter than the phone support they would be calling inside the company, so anyways it’s not a problem. The laws have changed to make it illegal to do some rooting activities, even to hardware that you bought and own. I think this reduction in our natural rights of ownership is dangerous and can lead to consumers being put in an unfair situation, and it also discourages consumers to explore and learn more about the technology they have become so dependent upon. CSDN: The integration of hardware is increasing, do you think doing hardware hacking is getting more and more difficult or do you worry about the hardware hackers to extinct? How could we change this situation? bunnie: The increasing integration has been true for a long time — from the TX-0 which just used transistors, to the Apple II which used TTL ICs, to the PCs which used controller chipsets, to the mobile phones which have just a single SoC now. It does make it harder to hack some parts, but there is always opportunities at the system integration level. In other words, I still think there is art in hardware, just the level at which hardware hackers have to work gets higher every day, and this is a good thing, because it means our hacks are also getting more powerful with time as well. CSDN: Your book is dedicated to Aaron Swartz, could you talk about why do you think the hacker spirit is important in our era today. bunnie: The hacker spirit is the ultimate expression of human problem solving ability. It’s about the ability to see the world for what it is, and not the constructs and conventions that society puts in place. A brick is not just used to make buildings, it can be a doorstop, a weapon, a paperweight, a heating ballast, or it can be ground up and used for soil. Hackers question convention through the lens of doing what’s most practical and correct for the situation at hand: they see things for what they are, and not by the labels put on them. Sometimes their methods are not always harmonious, as hackers often times prioritize doing the right thing over being nice or playing by the rules. I find the more difficult situations become, the more pervasive and stronger the hacker spirit becomes among common people. I see evidence of this around the world. It is linked to the human will to survive and to thrive. I think it’s important for a society to culture and tolerate the hacker spirit. Not everyone has it, but the few who do have it help make society more resilient and survivable in hard times. CSDN: Do you have other words you would like to share with Chinese readers? 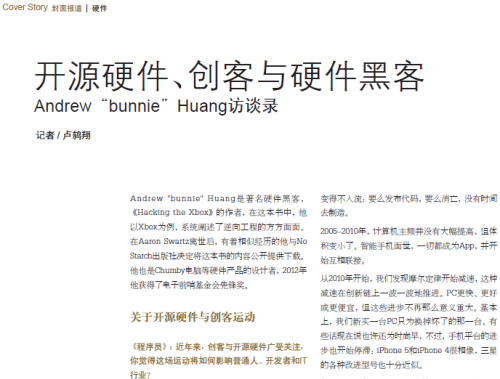 bunnie: Recently, I was reading some comments on a Chinese web forum, and it seems that many Chinese regard the term “Shanzhai” as a negative term. This was surprising to me, because as an outsider, I feel that the Shanzhai have done a lot of very interesting and useful innovation. I think in English, we have a similar problem. The term “hacker” in English started as a good term, but over time became associated with many kinds of negative acts. Recently the term “Maker” was coined to distinguish between the positive and negative aspects of hackers (I still call myself a hacker because I still adhere to the traditional definition of the word). It may be easier to explain the innovation happening in China, if in Chinese a similar linguistic bifurcation could happen. I had recently proposed referring to the innovative, open aspects of what the Shanzhai do as “gongkai” (公开), referring to their method of sharing design files. Significantly, the term 开放 as used in 开放源代码 I feel doesn’t quite apply, because it refers to a specific Western-centric legal aspect of being open, which is not applicable to the methods engaged in the Chinese ecosystem. However, the fact that China has found its own way to share IP, unique from the Western system, doesn’t mean it’s bad. I think in fact, it’s quite interesting and I’m very curious to see where it goes. Since I see positive value in some of the methods that the Shanzhai use, I’d propose using the more positive/generic term “gongkai” to describe the style of IP sharing commonly engaged in China. But then again, who am I to say — I’m not a native Chinese speaker, and maybe there is a much better way to address the situation.